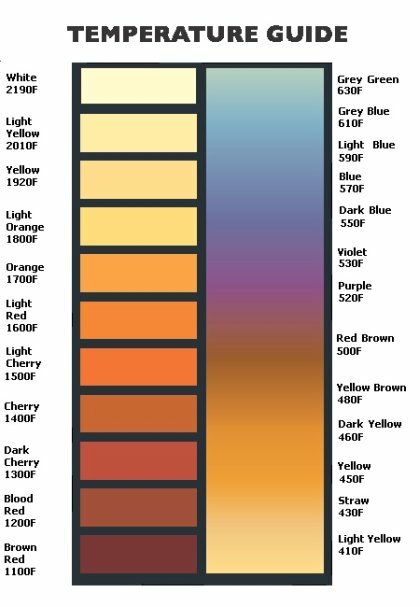 This temperature color guide is used to identify the approximate temperature in degrees Farenheit of steel at different temperatures. 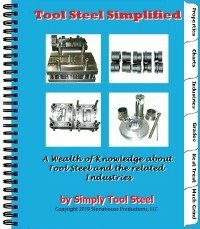 The left side of the color guide is generally used to identify the temperature of the steel during the austenizing phase of the heat treating process, or during the forging process. The right side of the temperature color guide is used to determine the temperature of the steel during the tempering phase of the heat treating process, or during operation. The colors indicted are only approximate. You should verify the actual temperature with a temperature gauge. Learn more about the heat treating process with our Heat Treating Introduction. or jump to our Austenizing or Tempering articles.